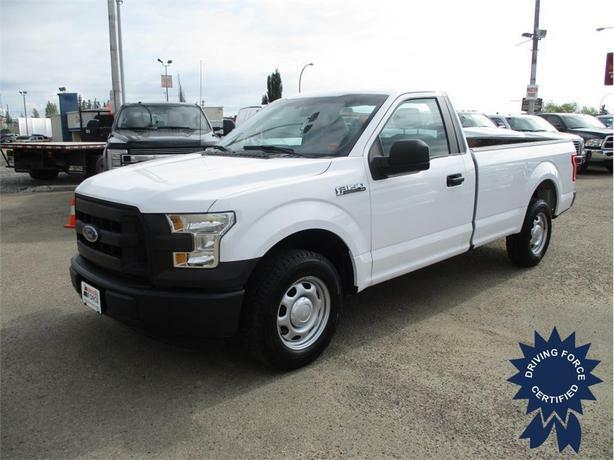 This 2016 Ford F-150 XL Regular Cab truck comes with rear wheel drive, a 141-inch wheelbase, 8-foot long box, electronic 6-speed automatic transmission, electronic locking with 3.55 axle ratio, 17-inch silver style wheels, Class IV trailer hitch receiver, integrated trailer brake controller, AM/FM stereo with single CD Player with clock, SYNC Voice Activated Connectivity System, 1,900 lbs Maximum Payload, cruise control, rear wheel drive, gas-pressurized shock absorbers, front anti-roll bar, electric power-assist speed-sensing steering, single stainless steel exhaust, towing with harness and trailer sway control, 200-amp alternator, block heater, fixed rear window, black grille, seating for three passengers, glove box, manual air-conditioning, pickup cargo box lights, power mirrors, and steel wheels. The 5.0-litre V8 gas engine provides 385 horsepower at 5750 RPM and 387 lb-ft of torque at 3850 RPM. The GVWR rating is 6,750 lbs (3,061 kgs). Take this one for a test drive with one of our sales consultants soon before it disappears from our sales lot.